Hooray! It’s $5 dinner week! Just to recap for those who aren’t in the loop, I’m taking part in the Slow Food USA $5 Challenge this Saturday. I’ll be making a totally from-scratch, sustainably sourced taco feast for friends and neighbors, all for under $5 a head; they’ll be contributing $5 each to the local Food Bank. We get a party, I get to blog about this awesome challenge, and our community gets a little help for those in need. I call that a win all the way around. However, I also decided to expand upon the challenge for myself by giving you not just the details of the $5-per-head taco night feast, but actually providing you with FIVE dinners that can be made for $5 or less per person (which is a pretty luxe standard, if you ask me; I can’t imagine what my food bills would look like if I spent $5 per person every single night!). But it’s actually shaping up to be a pretty fun series, because it meant that I could buy some slightly posh ingredients this week that would ordinarily have given me a twinge of guilt, all in the name of making a week’s worth of easy, healthy, real-food meals that anybody can feed to their families for less money than it would cost to get a fast-food meal. I know, I know — the sacrifices we bloggers make for our readers. Stay tuned for the rest of the week, when I share four more $5 dinners, and be sure to also come back next week for 4 dinners at $4 per head. RRG, for the near future, will be talking real food and real money. It can be done. These are delicious topped with smoked salmon, poached eggs, or eaten just on their own (my kids like to dip them in ketchup). You can also substitute sweet potatoes for the Yukon Golds, though they’ll be a little crunchier in the middles; I’ve also enjoyed switching out half of the potato for shredded zucchini. Place the shredded potatoes in the center of a clean, sturdy dishtowel. Wringing the towel over a sink, squeeze out any moisture in the potatoes. Put the dry potato shreds into a large bowl and add the grated onion, flour, eggs, salt, and pepper. Mix thoroughly with a fork until everything is evenly combined. In a large nonstick skillet over medium-high heat, warm a mixture of canola oil and olive oil — just enough to have about 1/4 inch coating on the bottom of the pan. When the oil is hot but not smoking, it’s time to cook the pancakes. Form the pancakes with a level 1/4-cup scoop; pat each one down firmly with the back of the measuring cup to spread the pancakes out into 4-inch-diameter rounds. Cook until golden brown on both sides, about 3-5 minutes per side; drain on paper towels, season again with a little coarse salt, and serve warm. This entry was posted in Accountability, Cooking, Food culture, Meal planning and tagged baking, cooking, family, Farmer's Markets, feeding kids, food, Household organization, meal planning, party, recipes, Slow Food USA. Bookmark the permalink. 7 Responses to It’s $5 Dinner Week! I love potato pancakes, but have started making them with sweet potatoes (healthier for me personally.) With yogurt and cinnamon, the closest I get to dessert! What a great idea to serve them to kids! We love them with sweet potatoes, too, as well as with shredded zucchini added. 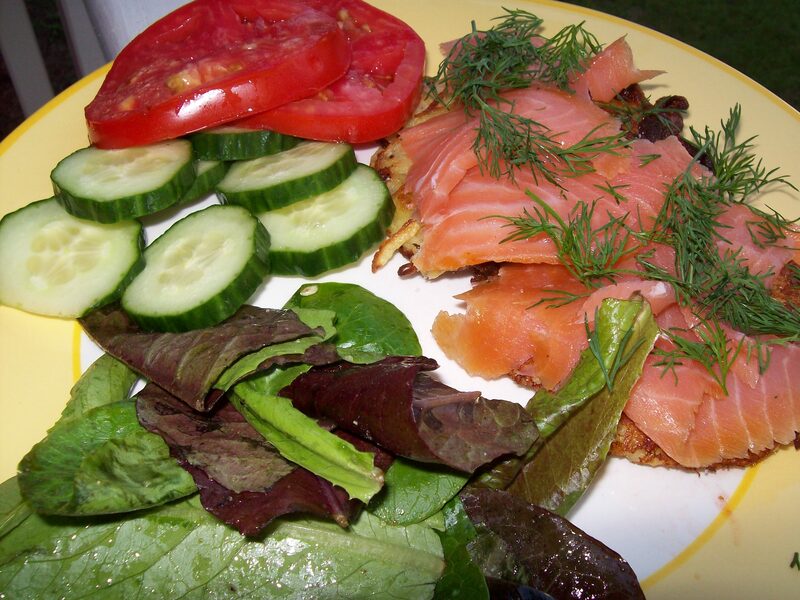 For this, though, I have to say it’ll always be the plain variety in my book — my family is part Swedish, and on Christmas Eve we always eat potato pancakes topped with smoked salmon. It’s a food memories kinda thing for me!